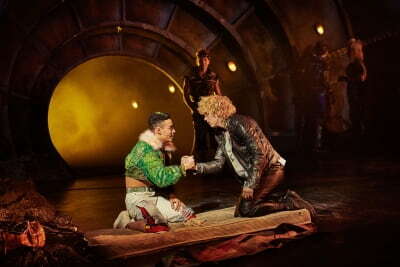 Those who like it, love it, and those who don’t, loathe it – Jim Steinman’s Bat Out of Hell The Musical, to give it its full title, has its enthusiastic supporters as well as its detractors, which is far better than having most people think of it as merely satisfactory. That there was a lot of love for the show following its initial runs in Manchester and in London didn’t stop the creative team from making alterations prior to the production’s run over in Toronto, before making even more changes prior to its return to the West End. This begs the question: what for? The alterations are not going to make those who didn’t enjoy their visit to ‘hell’ make a return visit any more palatable, and those who already appreciate the show for what it is might well be forgiven for wondering why on earth an attempt has been made at reinventing the wheel. It is no bad thing, ultimately, for a production to make modifications, and have them noticed by its regular attenders. And I must admit, being one of those in praise of the production in its previous incarnation at the London Coliseum, the revised version at the Dominion works very, very well. This isn’t just a case of older people reliving Meat Loaf’s yesteryear heyday – younger people in the audience seemed to be enjoying themselves just as much. For some shows, less is more, but here, the bigger the better. A cast of thirty-four and a band of twelve deliver the goods on and below the stage – a headcount easily doubled and then some once stage managers, dressers and other production staff are accounted for. Bat is back, and Bat is big. The choreography (Emma Portner), while energetic, remains bizarre in places, but is nonetheless fun to watch. Much of the cast has remained with the show since it was last in London, with the most notable new faces being that of Alex Thomas-Smith’s Tink, with a sprightly briskness that befits a character even younger than everyone else, and Wayne Robinson’s Jagwire, who holds his own alongside Bat veteran Danielle Steers’ Zahara: their rendering of ‘Two Out of Three Ain’t Bad’ is simply sublime. There are dynamic performances all round, and in terms of singing vocals, this production comes up trumps with passion and power. The set (Jon Bausor) continues to astonish, with a table whose cover is taken off to reveal a convertible car, and a motorcycle that ‘crashes’, sending its constituent parts flying out in different directions above the stage. The whole thing is ridiculously but marvellously over the top, and the special effects continue to demonstrate what theatre is now capable of delivering. The lead couple is frankly incredible, as is the supporting one, respectively providing some of the show’s most gripping moments (aside from, of course, the title song). Andrew Polec, already an award-winner, as Strat is wilder than ever, which makes his duet with Christina Bennington’s Raven, ‘For Crying Out Loud’, something of a masterclass both in vocal delivery and stage presence. Rob Fowler’s Falco and Sharon Sexton’s Sloane delight the audience in the first half in ‘Paradise By The Dashboard Light’, and in the second, the torch song ‘What Part of My Body Hurts The Most?’ couldn’t be more poignant if it tried. Also worthy of mention is Jonathan Cordin, standing in for Patrick Sullivan on press night as Blake: one wouldn’t have guessed an understudy was on. All the characters are named in the programme – quite astonishing, given most of them are never addressed by their names, and quite a few names are rather unique, including Bessamey (Dawnita Smith), Crysteva (Julie Stark) and Kwaiden (Rhianne-Louise McCaulsky). The comedy elements of the book come through stronger than they did previously. The storyline overall is more convincing, and the chemistry between the two main couples more palpable. I will, however, leave it to others to judge whether this is down to an increased hamminess that plays to the gallery, or if the show’s new home simply lends itself better to creating a more absorbing atmosphere, drawing the audience in and eliciting more enthusiastic responses. It is, in the end, as with any show with an open-ended run, the audience that will ultimately determine its longevity. However long Bat Out of Hell is in the West End for this time around, it’s a captivating and memorable production. Not to be missed.